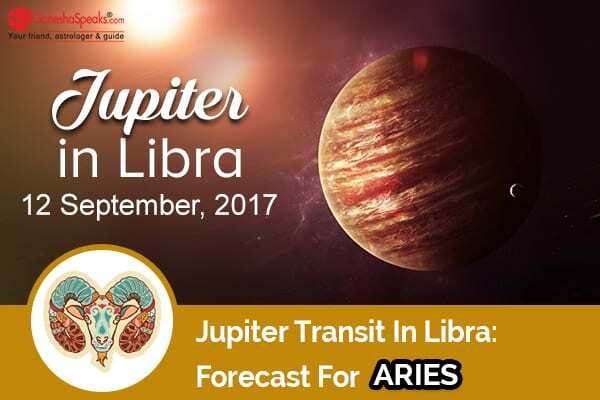 The planet of growth and expansion Jupiter will enter Libra sign on September 12, 2017, placing itself in the seventh house for the Aries natives. Jupiter transit in Libra 2017 will have a significant impact on the natives of Aries moon sign. The transit of Jupiter in Libra is going to influence various aspects of your lives when it gets posited in the 7th house. The changes may range from your prospective entry into an enriching business partnership to the probability of a delay in marriage and so on. Do you want to know how this transit may impact your career? Avail the exclusive Jupiter Transit Report For Career now! Jupiter rules areas such as education and higher learning, travel, promotion, publishing and so on. So, during this period, you are likely to see partnership developments in any of the before mentioned areas. Thus, you may develop a romantic or business partnership while you are travelling or in the pursuance of an educational course. This new partnership may even happen with a person belonging to a different culture during this Jupiter transit in Libra 2017. Stars predict good time for your business. Are you curious to know more about how will this Jupiter transit impact your business? If yes, avail the Jupiter Transit Report For Business and know your future. It is also likely that your existing partnership may strengthen through sharing of your personal beliefs during Jupiter transit in Libra. It may get strengthened while you are travelling or are on a journey. This partnership will gain and it may also contribute to raising your social esteem during this Jupiter transit in Libra 2017. Besides, there is also a strong possibility that you may get an opportunity to teach or counsel this year. This time of Jupiter transit in Libra 2017 will be marked by you sharing lot many things with people close to you. You will share your beliefs, interests and ideologies with people whom you are close to. This sharing will become the focal point in your deepening relationship. Besides, a significant person is likely to enter your life. He/she may be sharing with you his/her educational goals, belief systems and may come into your contact via long-distance connections, etc. This development is more likely to take place in August 2017. Besides, you are likely to come across people who will be on your side and will be co-operative. In fact, you are going to attract such persons to yourself during this Jupiter transit in Libra 2017. We need relationships to stay connected. And we need money to satisfy the needs and wants of our family members and relatives. Are you interested in knowing about your financial situation during this Jupiter transit? Get the Jupiter Transit Report For Finance and know what the stars say. During the transit of Jupiter in Libra, you may develop some difficulties in relationships. You are likely to come close to a person or persons who are more interested in their freedom than mixing up with you. Or there is a possibility, the persons you come across may be too individualistic and demanding. There may also be problems as one of your existing friends too may turn very demanding. This could make you feel heavy and difficult during this Jupiter transit in Libra 2017. You may also feel the tussle between your professional life and relationships. You will be wanting to put a lot of energy in relationships. However, there may be tremendous pressure to pursue career goals and you may also want to fulfil your responsibilities at the workplace. This will engage you in a conflict of interests and you are likely to feel overloaded during this Jupiter transit in Libra 2017. Curious to know about the Jupiter transit 2018 and the effects Of Jupiter Transit on Aries Moon Sign?